3- Autoimmune disease: with humoral autoimmunity to type II collagen. 4- Biochemical abnormalities: reactivation of the arrested secondary remodeling process within the cartilaginous rest areas of the otic capsule. a- Hereditary tendency: +ve family history in 50%. b- Endocrinal:increased by thyrotoxicosis & puberty. c- Pregnancy: accelerates the process. It is race dependent and within a race the incidence is likely to be related to gender and age. - Onset: 15 – 45 y. Female = male 2/1. - It is the commonest cause of bilateral conductive deafness (C.D) in adults. - Usually bilateral, but unilateral in 10%. - The incidence of histological otosclerosis in unselected temporal bones is in the range of 3.5%. - The incidence of presumptive clinical otosclerosis in the adult UK population is 2%. Replacement of normal compact lamellar bone by abnormal spongy bone of greater thickness, cellularity & vascularity with progressive fixation of stapes. Sites: Anterior margin of oval window (fissula antefenstam) 85% of cases. Fissula post fenstram >> Round window >> cochlear capsule. A: Stapedial Conductive hearing loss (commonest). 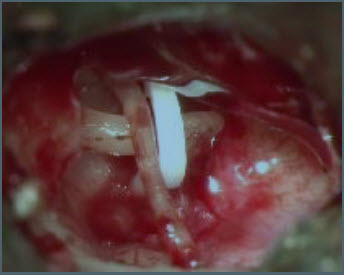 B: Pure cochlear: affection of endosteal layer of labyrinth >> SNHL (rare). C: Mixed: mixed hearing loss. 3- Paracusis willsii: hearing better in noisy places due to rising of friend’s voice. - Intact normal T.M, in active otosclerosis dilated B.V on promontory produce flamingo red tinge (schwartze sign). - Tunning fork: bilateral C.D variable degree (rarely SNHL or mixed). - PTA: - In stapedial otosclerosis: Bilateral symmetrical C.D. 2-Radiology: CT shows otosclerotic foci. (A) No ttt: in mild cases AB gap < 20dB. (B) Surgical ttt: stapedectomy: ttt of choice, done for worse ear 1st. (C) Hearing aid. Good alternative to surgery if operation is contraindicated, refused,or failed. (D)Medical ttt: Sodium fluoride therapy. Action: Causes maturation of the active otosclerotic foci. Dose: 30mg enteric coated tab T.D.S. after meals up to 2 y with ca & vit.D. Contraindication: pregnancy, young age, renal dysfunction, rheumatoid. - The incidence is declining. - It’s either: stapedial, cochlear or mixed. It starts as unilateral disease however bilateral affection is not uncommon. - Treatment is either by observation and regular follow up, hearing aid, medical with floride medications or surgical with stapedectomy or stapedotomy. 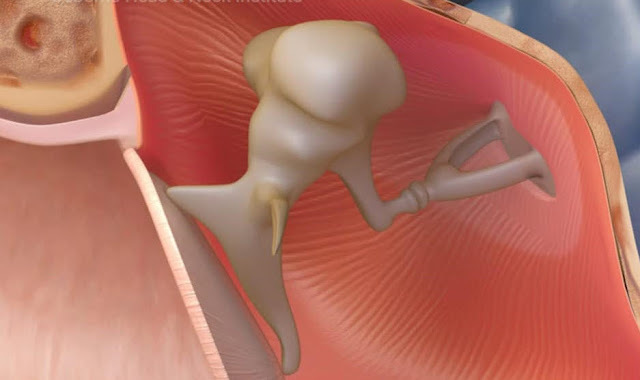 - The stapedial type is the most common type and it’s a very common cause for conductive hearing loss with intact normal tympanic membrane.